I have always valued the Hindu rituals growing up and there is no denying that. But, that does not hold me back from aspiring to one day appreciate Buddhism in all its beauty. My regard for this religion comes not just from the solace that their monasteries (gompa) have always granted me, right from the first time that I entered one in my troubled times to every single time I do go back, but also because of how the people of this faith just are. I am yet to come across an agitated or envious buddhist! Qualities, unfortunately, that are so common and everyday otherwise. By now, everyone reading this blog knows of my eternal love for the Himalayas and I believe there is no better home to Buddhism. Which brings me to this blog post, Where The Monasteries Are. 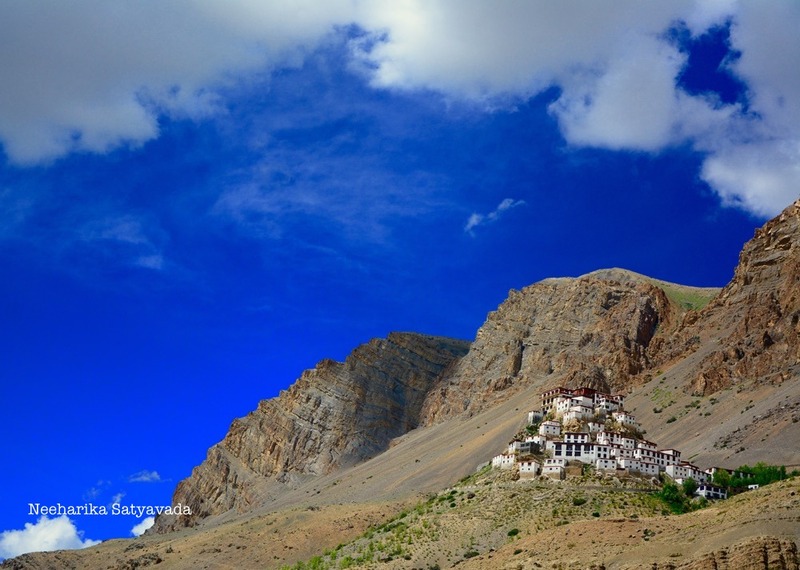 A list of monasteries in Spiti. Kaza is the main town in the Lahaul & Spiti District of Himachal Pradesh and usually acts as the pitstop for most of your exploring in this district. Though the monastery in Kaza is not counted amongst the “important” monasteries of the region, it does not lack in beauty or tranquility. & for me, monasteries have always been places of quietude, which immediately fill you with a sense of peace & calm. So, there it is, flagging off this list of Himalayan Monasteries. Twelve kilometres from Kaza is the little village of Ki and sitting atop a hill, overlooking this village is the largest Buddhist Gompa & Learning Centre of Spiti. It is also one of the most frequented and photographed in the region. Its popularity stems from how this monastery is built like a fort in the Pasada Style of architecture. Once inside, you realise that it it is not just the monastery nestled in the mountains that makes a pretty picture but that the views from it are just as scenic. Tabo was not on the agenda of the group I was travelling with. But, I was lucky enough to make some friends along the way who were just as keen on visiting Tabo, despite the ‘no photography rule’. So, after some trifling deliberation, we finally managed to convince the driver of one of the SUVs to drive us to Tabo, while the rest headed back to Kaza. & I can gladly say it was one of the best decisions on this trip! Tabo is a small valley 48 kilometres southeast of Kaza. The Tabo Gompa founded in 996AD is said to be the oldest continuously functioning monastery in India and it being declared a UNESCO Heritage Site has been in the offing for a while now. Its claim to fame though, ironically, is that it was the setting of a Bollywood movie in 2003! The mud-brick wall temple complexes of the Tabo Gompa house some of the most exquisite Indo-Tibetan art that I have ever seen. The murals not only hold religious & aesthetic significance but are important historically as well, as a remnant of the early buddhist culture. Here in & rightly so, comes the no photography rule. But, there is so much to see and discover even around the Gompa in Tabo that I for once am glad it is a non-photographer zone!! The main stupa outside the temple complex. The hillside caves up above the village and the monastery is where the monks used to live once. It is now an Archaeological Survey of India protected site.